The CancerGram was a daily practice I undertook starting shortly after I had survived radiation. I was starting to feel better and wanted to tell the story. I was overwhelmed my the scope and scale of the experience and felt incapable of a comprehensive narration. I resolved on a daily practice in which I would reconstruct the timeline of my cancer diagnosis linearly through daily social media posts. Based on my notes and journals, I started with early symptoms of prostate discomfort and worked forward in time. Each day I made a digital drawing in a mobile app. Each drawing consisted of text, a finger or thumb scribble and a hazy color background I made one of these each day and posted them immediately to Instagram and Facebook, sometimes with explanatory text and hashtags. Each evening I would make a follow up post related to the first, generally a photograph, but as the project evolved over the summer, I started making digital images, short videos or animations. The idea was to work quickly, to learn or practice something, and to put the work into the public sphere in social media. Having little experience with social media, the responses were limited. Eventually I started popping up in the feeds of old friends. The responses were intense and not always unwelcome. There was general confusion over the posts not corresponding to real time. I was consistently posting about experiences years and months in the past. The original cancergram concluded on a dark note with my death vision in July 2017. I reprised the practice in the summer of 2018 to allay fears of my death and conclude with a more hopeful tone. This exhibition did the cancergram some justice. I culled the images from the first leg of the raw gram into 18 zines that visualize the story arc of my diagnosis. The 9 animation loops provide a persistent vision of the work that doesn’t go away. Copies of the zines were given to gallery visitors throughout the show. 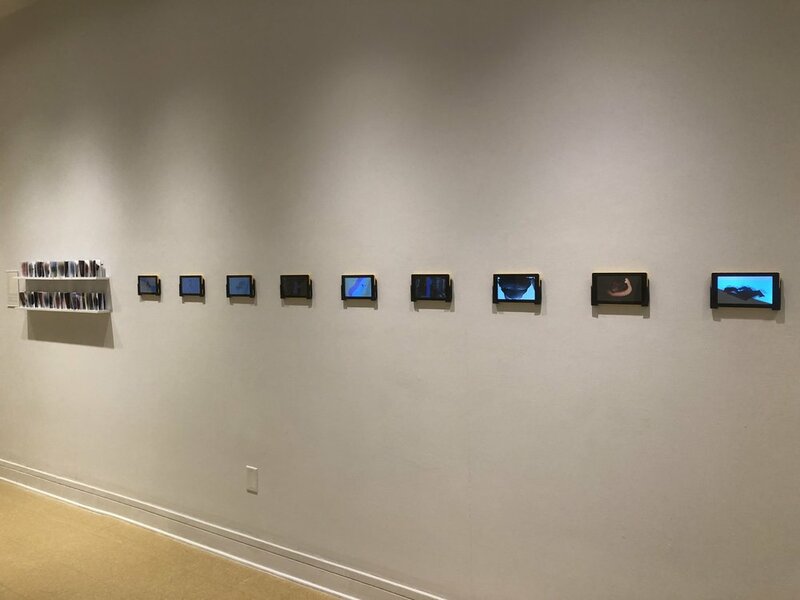 The videos were looped on Amazon Fire tablets mounted wirelessly on the wall. I generally feel that the work didn’t have great impact. There’s no linear video for the festival screen. The work doesn’t feel available to its potential audience. The importance of the seamless loop of each video meant that each needed its own monitor and that a linear edit felt inconsistent with the desired persistence. In the hope of extending the availability of the work and perhaps to archive it outside of instagram, I’m trying to put them up on my website. The hard part is to get them looping consistently. It seems to be brower-sensitive.